Again, it’s been too long since I’ve written one of these. It’s the same excuse, too – I’ve been busy. The guys were jabbering on about how they wanted to move to bigger, better things, and more importantly they wanted more flexibility to be able to do what they wanted. So the guys thought of various options for creating our next game, we had chosen Flash and were set on it for a while. Then, out of nowhere a ghost appeared, and had told us if we wanted to live we shouldn’t use Flash. While confused and not sure if they were hallucinating, the guys asked the ghost what they should use instead, and so the ghost looked at them with a pretty damn angry frown and remarked “Unity, you fool!” and then proceeded to spin around and dissapate into nothing. Still confused, the guys Googled “Unity” and then after some research, we threw Flash out of the window, installed Unity and began learning how to create real games. So while we have a lot to learn and don’t really have anything to show yet, I’ve been working on a side project because of all the free time I have, if you direct your eyeballs up, that’s the project so far. And now for the explanation! I guess I’ll start by outlining the general drift of the project. It’s a game, a top-down shooter type thing featuring magic instead of guns, and the whole point of it is that you’re thrown into a dungeon, consisting of a user-selected amount of rooms probably between 10×10-100×100, and some other options. 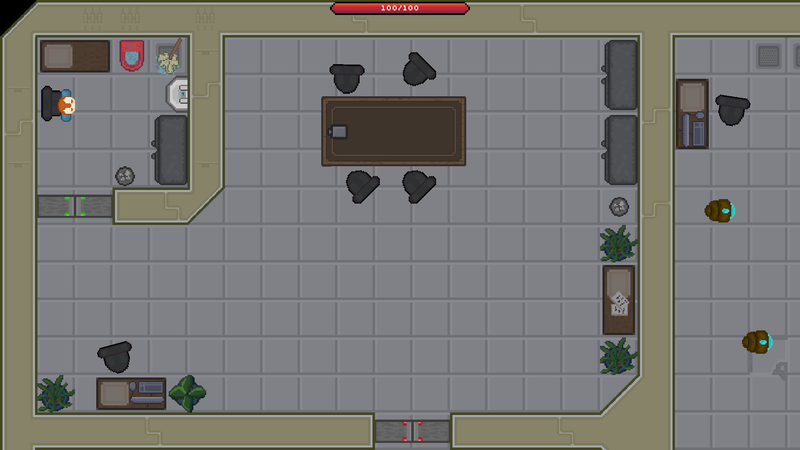 This dungeon will be generated randomly each time, with the paths and rooms that connect together will be random, along with the monsters, traps and decorations in each of these rooms. The goal of the game is simple, go to each of the four areas in the dungeon and defeat each areas boss. Obviously the dungeon is in very early stages currently but I’m going to go through the process of generating what I have so far and maybe some plans about where I want this project headed. So first off, I randomise the order of the four coloured areas, using the Fisher-Yates Shuffle. Next comes the process of placing all of the floors in a grid, you can think of a floor as a room. Placing them is done with a nested for-loop, I should mention that just after the placement of each floor I run a method called SetFloorState, which gets the position of that floor and depending on the position and the user-settings, decides what area that room should be. I say ‘area’ but I mean the elemental state that the room is themed, water, air, earth and fire. And the grey section you see is the neutral area, where the player starts in the dungeon. Next comes placing the walls, again I use a few nested for-loops placing a wall around all of the edges of each floor. And that’s about I have currently for the dungeon generation so far, I do have a prototype of the player movement/combat, but cannot combine it with the dungeon until the pathways are open and there are monsters to kill and possibly stuff to loot. So what started this project? Well, since we’ve all been learning unity, I thought it’d be a good idea to try and plan, manage, develop and complete a small game after we’ve got ourselves up to speed to experience the full unity workflow that we’ll have to deal with for the coming months/years, and to test our knowledge/skills of course. Jess is the lead programmer at Hot Box Games.